Interpreting oriental rugs into mosaics is like a childhood dream come true. I was always lured and fascinated by the colors, patterns and the mystery of rugs. 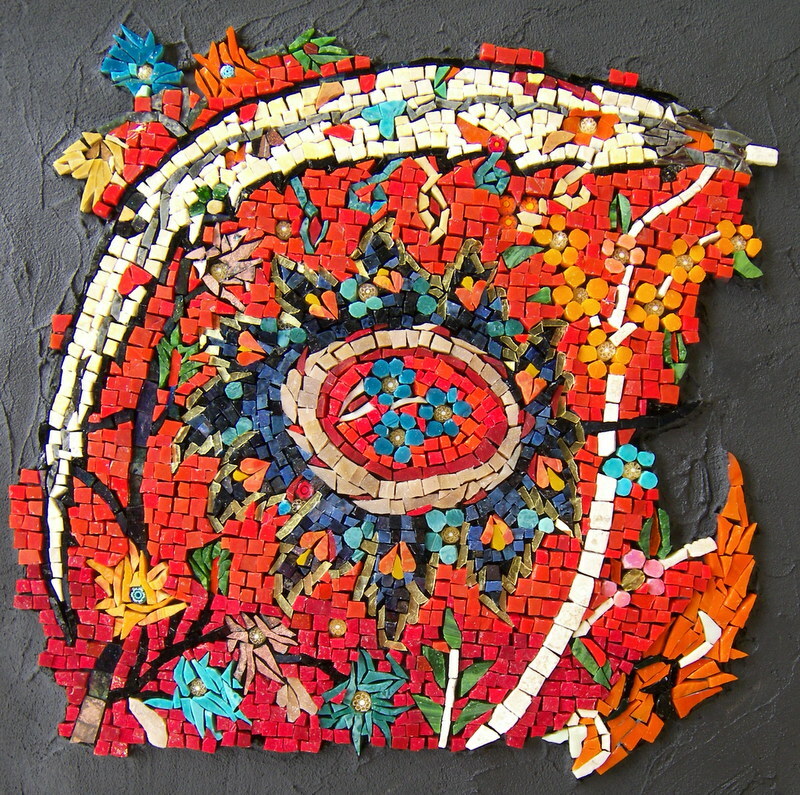 When I adventured into interpreting them in mosaics at a small scale, it immediately became an addictive challenge. Looking at an oriental rug, I get the sense of happiness as is the feeling I get while interpreting a rug into a mosaic. I am very attracted to tribal rugs from all parts of central Asia and my passion is to pay tribute to them by reproducing, reinterpreting, or composing them in mosaics. The process of doing them is technically challenging in view of the non traditional way of making the cuts. From start to finish the satisfaction to me is visually infinite. 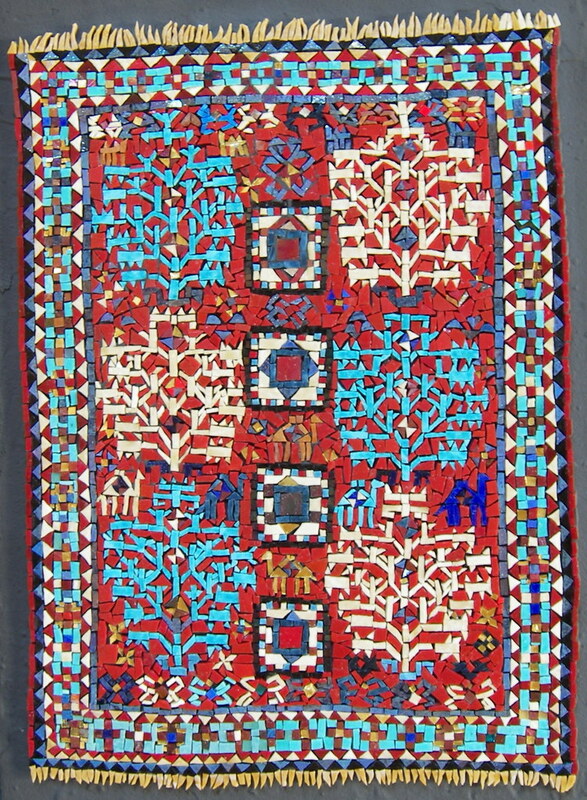 Kazak Rug, Tree-of-Life, 19th century. Camels are rare motifs on Caucasian rugs because they are non-existent in the Caucasus. Smalti, gold. (30cmX43cm). May – November 2007. 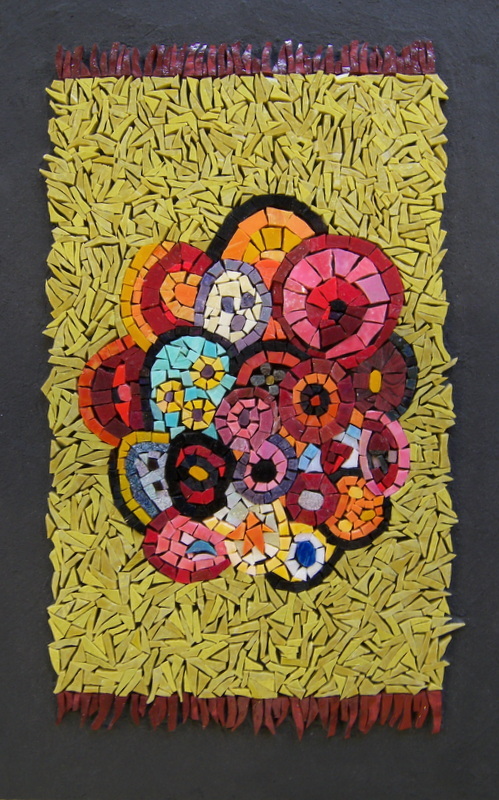 This mosaic participated in the International Mosaic Festival, first edition 2009 in Ravenna, Italy. Kilim1. Central Anatolia. Smalti, marble, gold. 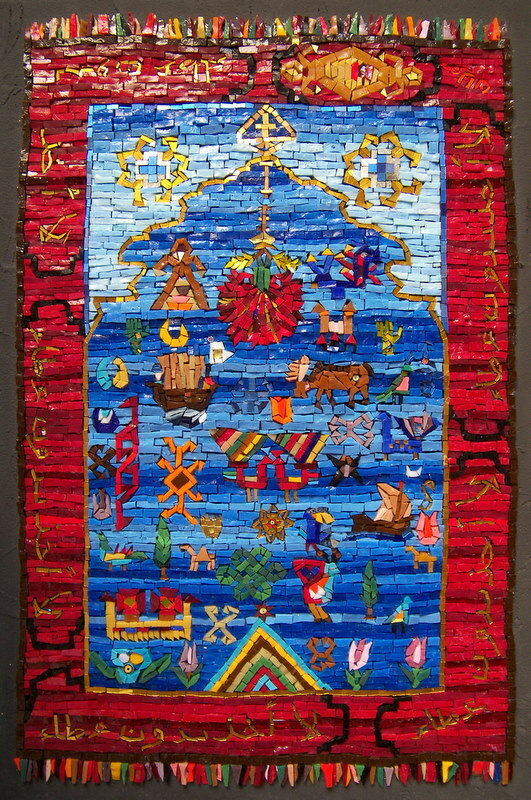 (28cm X 70cm). July 2008- February 2009. Venetian Rug. 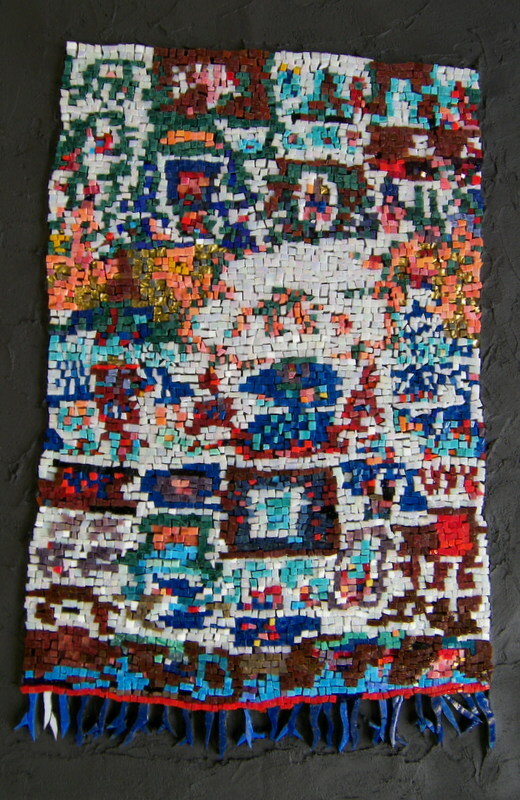 Composition from a variety of motifs of many different tribal rugs. Smalti and gold. (39cmX61cm). March – June 2009. Shaggy Anatolian1. Composition according to ‘flying’ tribal rugs exhibition seen in Otranto Italy, in 2008. Smalti. (38cmX67cm). June – August 2009. Star, Cross, Moon or Dream & Reality. Composition according to ‘flying’ tribal rugs exhibition seen in Otranto, Italy, in 2008. Smalti and silver. (23cmX56cm). July – August 2010. Shaggy Anatolian2. Composition according to ‘flying’ tribal rugs exhibition seen in Otranto, Italy, in 2008. Smalti. (28cmX127cm). August – October 2009. This piece won a prize at the Montreal International Design show in May 2011. Circles. Composition by Suzanne Spahi according to a 1925 rug by Edouard Bénédictus. Mexian smalti (29cmX33cm). Novermber-December 2010. Kilim2. Central Anatolia. Smalti, marble, gold. (30cmX 84cm). December 2010- February 2011. Bluemosaic or Life passes like a mysterious caravan, take from it its moment of joy. Omar Khayyam (1048-1122) Italian smalti, millerfiori and gold. (23cmX37cm) August 2011. 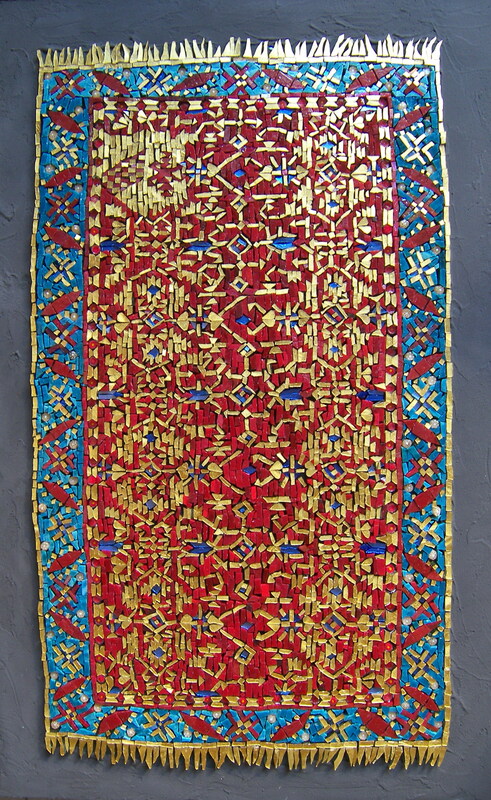 South-west Anatolian Kilim (The Galveston Collection original size 1.5mX 2.81) Smalti and gold. Mosaic size: 26cm X 49cm. October 13, 2011- February 5, 2012. 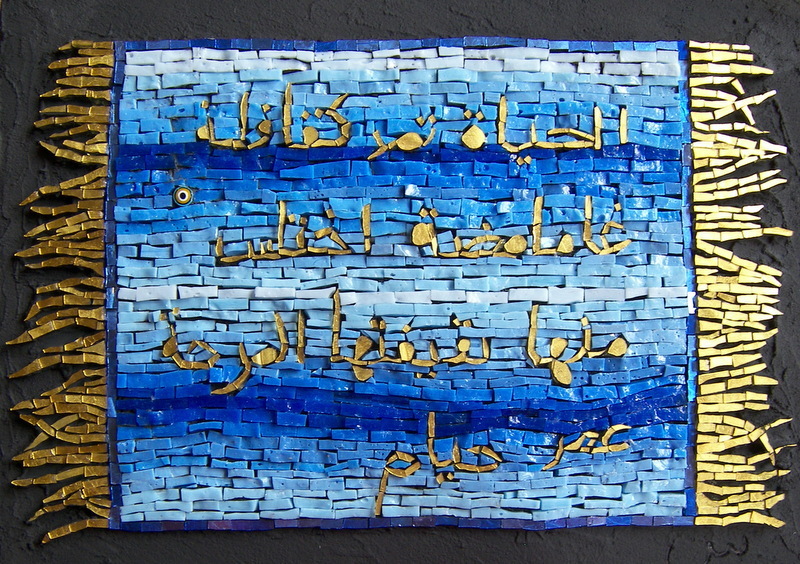 This mosaic won third prize in Gaziantep, Turkey in an International mosaic competition in October 2013. ‘Tuduk or not Tuduk’ or ‘Lotto’ design carpet. Workshop of Tuduk, Romania, circa 1925-1940. Original size of rug 213cmX 304cm. Joseph McMullan armorial carpet, The Metropolitan Museum of Art, New York. From the book Handbook of Fakes by Tuduk (worlds’ most famous rug forger) by Stefano Ionescu. Mosaic size: 54cm X 30cm. Smalti, millefiori and gold. February 12 – November 16, 2012. 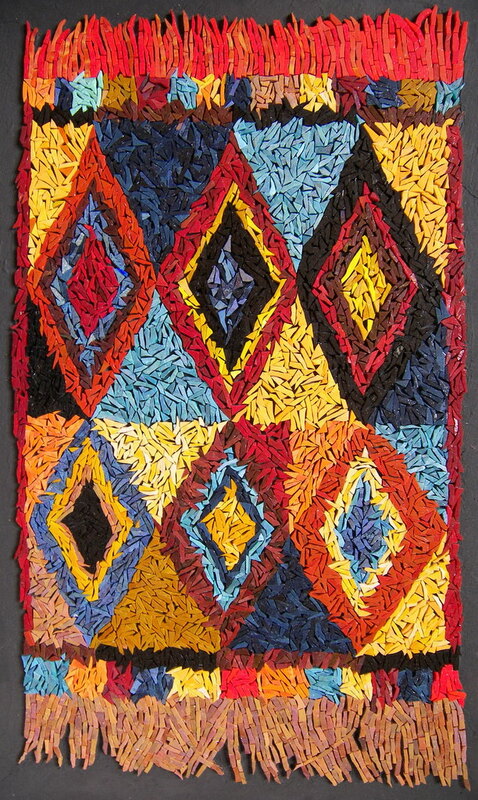 Moroccan ‘boucherouite’ rag rug 1. (From the collection of Gebhart Blazek/Berber carpets + textiles) Original rug size: 290cm X 100cm, end of 20th Century. Smalti, gold, glass fusions by Martin Cheek. November 23, 2012 – January 17, 2013. Mosaic size: 25cm X 82cm. Moroccan vitage rug 2. (From the collection of Gebhart Blazek/Berber carpets + textiles) Ourika Valley Boucherouite, Morocco,.Original rug size: 120cm X 170cm. Smalti, gold and antique gold smalti. 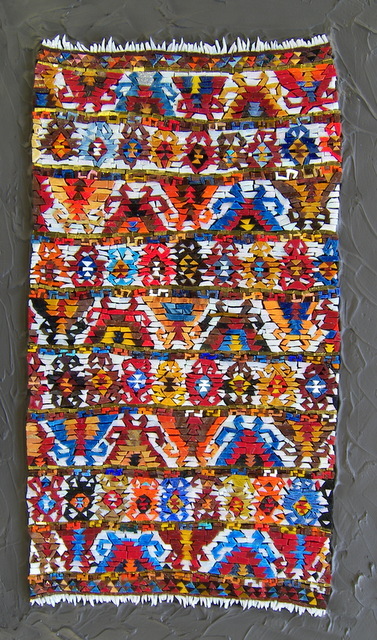 Mosaic size 29cm X43 cm. July 21- August 21, 2013. Detail of The Clark Sickle-Leaf Carpet (from the stored collection of the Corcoran Gallery of Art) Original was sold in June 2013 at Sotheby’s for $33,765,000, world record price for a 17th Century Persian rug. The original size of the rug measures 2.67 X 1.96m. Smalti, gold, marble and millefiori. Mosaic size: 25cm X 26cm. August 2013.